Our new working paper wants to contribute to the special report on the impacts of average global warming of 1.5°C above pre-industrial levels that the Intergovernmental Panel on Climate Change (IPCC) will produce in 2018. 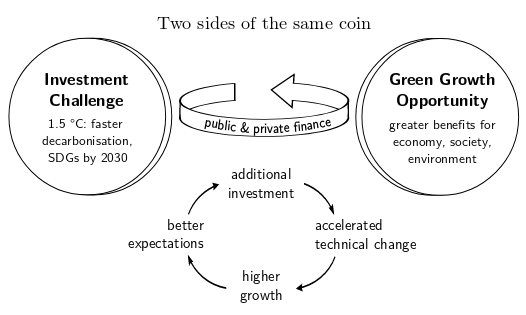 In contrast to a classical perspective on climate policy, which focuses on costs, our paper proposes a win-win framing: The 1:5C scenario should be seen as an opportunity for the world to achieve a Great Transition to green growth. Since the latter combines ecological, economic and social aspects of development it is closely linked to and shows synergies with the idea of sustainable development as described by the Sustainable Development Goals. With this article, the authors outline the investment needs of such a scenario and the mechanisms that can turn this challenge into a green growth opportunity, e.g. technical progress and a re-coordination of expectations.